We are not monkeys anymore ! Are we ? If you see monkeys in the wild, you will find they have close representation to the way we live in the domestic set up. Monkeys sit in groups and pluck lice in their heads. They take care of their kids in a way that the mother monkey carries the little monkey around her and goes from one tree to another. They seem to be cracking jokes and laughing at one another. Some monkey pushes another monkey into water and laugh at it. In cases of food, you will find that monkeys steal from the other monkeys. There are lot of ways they do that, in some cases they do meticulous planning of cheating another monkey or animal, by diverting the focus and so on. This is well displayed in the movie – Madagascar Trip to Africa. We have lot of qualities that are seen in another animals in nature. People do things which we consider bad. We have come a long way from the wild and the only thing that separates us from the wild is we can learn. We choose to learn and be of the kind that grew to become the most powerful species on earth. Along the way we did lot of disruption and imbalance in the ecosystem, but today I want to talk about what differs us from the wild. The act of killing is natural in the wild. A lion kills any animal it wants. We humans created a sense of care and kindness in us. We introduced the concept of judgement into our lives. For us , now it not only matter the act of killing but the circumstances and need that gave rise to killing. So it is ok for us when a soldier kills another human on the battle field, it is ok for us if someone kills for self protection, it is ok for us if someone kills for survival in places where there is no vegetation. Slowly humans started to define their own ways for what is ok and what is not ok. Whenever there was a dispute in ideologies or thoughts, a new community was born. Clans got separated from one another and decided to build a world they deemed to be correct. But within us there is this wild animal sleeping in the coldest of ice ages. With the continuous perseverance of humans to build a better society, we have managed to suppress that animal inside of us. That animal keeps coming out every now and then. A security chief in an organisation talks about security measures during a training session to the new comers. As per him, most often complaints are reported of a missing mobile charger and like wise. He said that it is intrinsic nature of humans to steal or grab things that are unnoticed. Anything at glitters and shiny is most often the subject of being stolen and the biggest challenge faced by them was to identify those people as they were not some outsider but their own people – the insiders. I keep thinking about this often and cannot quite pin down on what exactly can be done about this. At this moment I refuse to agree that it is a natural thing to steal. We are not monkeys. We are not in the wild. We have moved to civilisation, we live in society, so we have made the decision to let go of those natural wild traits and adapt to what we feel helps us to be a better society. This gives rise to a ambiguious lifestyle, which is why we keep fighting always. But if we are to continue believing that our thoughts and the choices we have taken have kept us alive longer than we expected on this planet then we should continue doing so. And in doing so, I refuse to accept that we humans are stealers. We are not monkeys anymore. And we have chosen not to let that animal from the wild appear before us in this domesticated environment. Let us work towards teaching our kids the way to be a human. Let us make them understand that we are people bound to follow righteousness without any relative attributions. Let us understand that we are the makers of our world and we are capable of changing it. Chivalry – The combination of qualities expected of an ideal knight, namely courage, honour, courtesy, justice, and a readiness to help the weak. 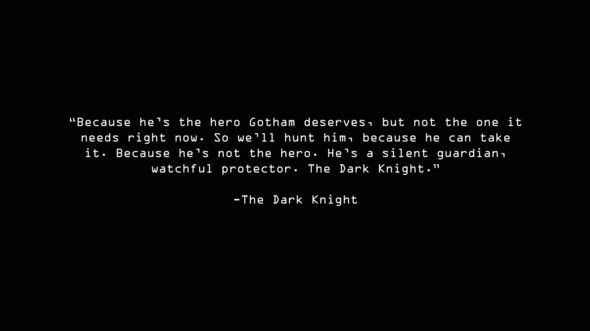 Batman was a Dark Knight, a Silent Guardian. He would come and do his work, but no one would ever know that. Evil was his best companion, though in opposite court, but only Evil knew of all the good work did. I think each one of the bloggers here, share some traits of a Knight, to talk courageously about things that matter. Being courteous to fellow person in sharing opinion, correcting them and providing suggestions. They are ready to help the readers, the subscribers and fellow bloggers. It is an honour to write, to express and to create. We speak of Justice and try to understand situations in various ways. There is a Knight in all of us. Welcome my Dark Knight ! What do you think, are you willing to be a Dark Knight ? I am in my natural and free state, very tough on the outside. I have the crust that takes care of all the evils and vibes from the outside world. If you manage to break my shell, you will find me runny and moist. I will not be able to hold my self, there would be a part of me that would still stay intact, but a lot of me would be formless. This would happen because you didn’t know how to handle me. If you would have taken time to be with me like the boiling water in a vessel enclosed. If you take some moments and experience the warmth with me, you will come to know of a different form within me. I will now become a completely transformed individual who can be tough on the outside and solid on the inside. If you break past the hard crust, you will reach the soft part of my heart. You will discover a caring and nurturing being that didn’t exist when you break it untimely. If you be careful and get past my softness, you will reach to a point to know that I am made of an inner core. The core values and virtues that make me. The kind of being that comprises of a soul, you will find it to be vibrant and pious. You know for one that your time and patience was worth and you would be glad to have known what I am on the inside. If you felt this was wonderful, then you should know that there is something more to it. If you can manage to prove the warmth in a way that I could be fertile and if you have the patience to let it bloom until all the time it needs, you will realize that I am capable of carrying a life on the inside. When you wait for the right time, life will break the shell from the inside and it will make way through the broken pieces to walk into the world. This will be knowing and experiencing me in the completeness of me. I am like an egg, now it is on you if you break it untimely and run into an omelet or take time to boil and share the warmth to know the inner core or fertilize and stay till the end, when it unleashes from the inside to know the true me.